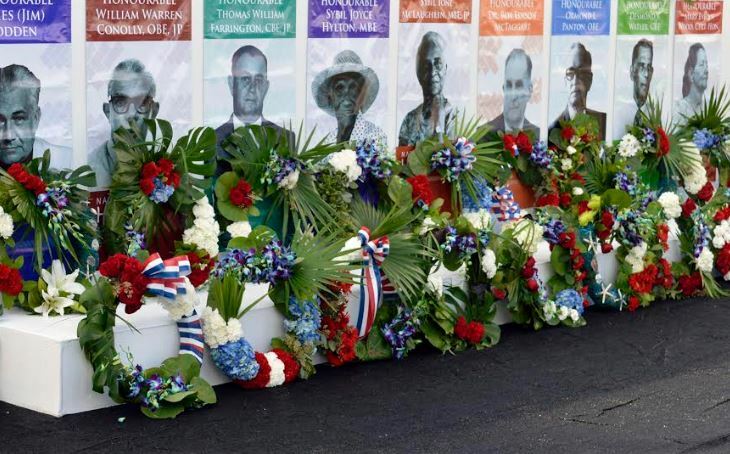 A total of 54 honours were bestowed to the Vestrymen and Justices of the Peace who were instrumental in the creation of the Cayman Islands’ Coat of Arms at the National Heroes Day 2019 celebrations today. Crowds of people braved the windy weather to attend the annual national celebration, which took place in Heroes Square, George Town. A host of dignitaries were in attendance, including His Excellency the Governor Mr. Martyn Roper, the Premier, Hon. Alden McLaughlin, Ministers, coat of arms pioneers’ families, friends, representatives from long-standing organisations in the Cayman Islands, and the general public. “My heart was filled with pride as I watched those precious children walking past while waving flags and hearing our National Anthem, God Save the Queen. These are meaningful symbols of who we are as Caymanians, as is our Coat of Arms,” said Premier Alden McLaughlin. “It was the conferral of our Coat of Arms that began our incredible journey as three small islands in the northwest Caribbean Sea that today have emerged from relative obscurity onto the world’s stage," added McLaughlin. The Premier hosted the event along with Dwayne Seymour, Minister for Health Environment, Culture and Housing, and Celebrate Cayman. A colourful parade to commence the day’s celebrations included the Royal Cayman Islands Police Service (RCIPS) Band, as well as detachments from the RCIPS, the Cayman Islands Fire Service, the Prison Service, Girls Brigade, Scouts, Cadet Corps, and Seventh Day Adventist Pathfinders. Following opening remarks by the Premier, family members of 1956-58 Vestrymen and Justices of the Peace, who played a role in the creation of the Coat of Arms, received a framed certificate honouring these pioneers. Captain Owen Farrington and Linberg Eden, the two living Vestryman from that period, received a Celebrate Cayman anniversary coin. The Leader of the Opposition, Hon. Ezzard Miller, gave a special recognition to the coat of arms architects. 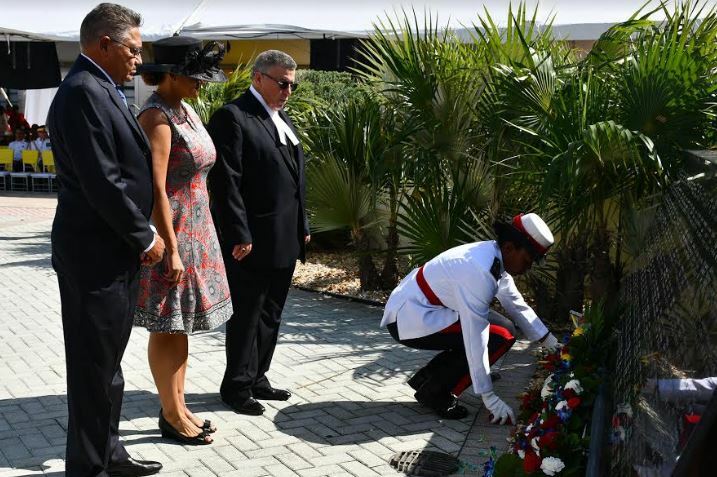 The National Heroes Commemoration, honouring the Cayman Islands’ nine National Heroes was delivered by Marzeta Bodden, Deputy Executive Chairman of Celebrate Cayman and this year’s National Heroes Day celebrations Master of Ceremonies. 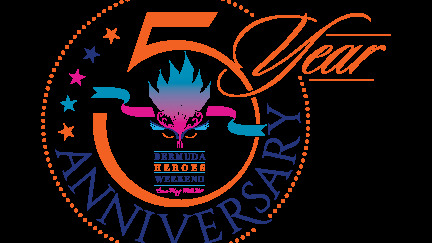 Over 60 ‘founding organisations were also recognised for their 50+ years of service to the people of the Cayman Islands. These recognitions highlighted the growth of various industries and sectors on the three islands and the long-standing role of such organisations along our journey to modern day Cayman Islands. The Cayman Islands Scout Association gave a touching salute in tribute of the late Joanna Clarke, who was instrumental to the scout’s programme. A performance of the National Song by Erica Assai alongside the Savannah Primary School choir closed the ceremony. The awards ceremony was followed by the Coat of Arms travelling exhibit in George Town Library. The main exhibit is currently open at the Cayman Islands National Museum in George Town until June 2019. Attendees also enjoyed live entertainment from the members of the Cayman Islands Music Association, as well as a taste of local food.